Let's just say I am no stranger to getting sick. If you need a refresher on this subject you can go HERE or HERE. I have a horrible immune system (whole other topic) and so if it is out there, then I get it. So, Thursday night I start feeling a little queezy. Nothing too major, just nauseated. It doesn't go away and starts to get a little worse. Well, with our experience in the past, Justin runs off to the store to get a pregnancy test. By the time he gets back, I am not sick..........I feel like I am dying!!!! I have now thrown up everything in my body from the last year and, to save you from the gory details, I am just convulsing with pain. Justin freaks and wants to call an ambulance.......me, formerly being in the medical insurance billing field, tell him it is way too expensive. So, dad sits with the girls and off to the hospital we go. We get there and are told that we will have to wait. So if I have to yak, I get to use the public waiting room bathroom. Isn't this just great!!! Within no time, I am on the floor in the bathroom in front of the world. Well, an hour and a half later they so kindly get us back and realize that I really am very sick. She puts it in speed mode now and they get me all fixed up with their drugs and tests. All we found out is that it wasn't food poisoning since my white count was so high, so that leaves us with some "unknown" virus. Whatever it was........it was a DOOZY! I got out the next morning and really didn't feel too good until Sunday. I don't want to be a "Debbie Downer" today, but it was a sad day around the Leach/Joiner (my parents) house. We had to put our cat, Obedi (yes I named him), to sleep. He has had a very long (12 years to be exact) life. He was with us through my high school graduation, college years, marriage, birth #1 and birth #2. The girls loved to lay with him, pet him, and often read to him. I know this has been much harder on my mom and I ask that you please pray for her during this time. Justin and I had a conversation one time about pets. He said, "You know, sometimes it's not even worth having them because you know that one day you are going to have to lose them." But then as we talked, we both agreed that you can never describe the joy that a family pet brings to your life. They put up with your mood swings and are still there to cuddle with during the hard times. They love you unconditionally! Here are some memories of "O.B." I am orphaned once again due to Justin's job (starting to really not like this). 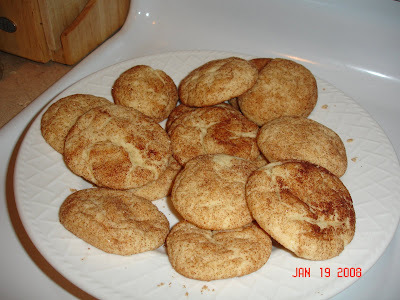 So, I decided to be productive today and make Snickerdoodle cookies. I mean, REAL ones from scratch and not from a package! I was so impressed with myself and they turned out amazing if I do say so myself (almost as good as Quizno's). WOW! I am beginning to get pretty domestic......watch out! Went out to dinner Thursday night. My car. One glass of wine. Carpooled from dinner to go out to one more place. Everyone in my car. At the next spot, I do the Diet Coke with Lime thing. My favorite scotch (Lagavulin 16 year) arrives under my nose. "Can't do it," I say. Then I find out my friend has switched to Designated Driver and has a plan that involves everyone getting home safe. Cool. I love Lagavulin when the time is right. Now it's the end of the night and I'm feeling wonderfully buzzy and ready to get dropped off to my house in my car, except the person that was going to follow my car in the DD's car to drive him back isn't in shape to drive either. It's 2 o'clock in the morning. I call my housemate Chad. Chad's sleeping. He was in the studio all day. I explain to him that I need him to jump in the back seat of my car, ride to the DD's car and drive me back home. Of course Chad says "yes" and comes through like a champ. A champ, I say. Here's what I want to tell you:If I, incredibly hot/fugly John Mayer can make that call, so can you. The distance from the parking lot to my house was about 5 miles, mostly straight shot up the coast of Santa Monica, zero traffic. And I didn't drive it. Me. The guy who gets the VIP velvet rope treatment in life. Oh, and the call? It's not the coolest you'll ever sound. And the logistics? It's kind of inelegant. You trace the same route twice when all you want to do is fall into bed. But you gotta do it. I'm not writing this to earn golf claps, it's just that if I'm going to stand in any way as an ambassador of something cool or influential, this is more important than any pair of sneakers or a guitar. And to give a big high five to the Chads of the world. I had been cleaning the house all day today and took a break to snuggle up with Brynn in the chair. She has this stuffed cat that she carries everywhere. By now, it is starting to look pretty ratty and bad so I thought we might need to discuss retiring cat pretty soon. ME: Brynn, maybe we need to put cat away because he is very dirty. ME: It is hard for me to clean him and I don't think I can. B: I think he is dirty from your hair! WHAT?! Guess I was a little dirtier than I thought. Happy Monday! MUCH better!!! Thanks Megan for the honest input! I have been orphaned over the last week due to Justin's new job. He is putting in 14 hour days and so we haven't seen him too much lately. It has been very stressful and depressing but we are making it through. I seriously do not see how single moms do it. Maybe I am just a wimp. Anyways....we are officially POTTY TRAINED! 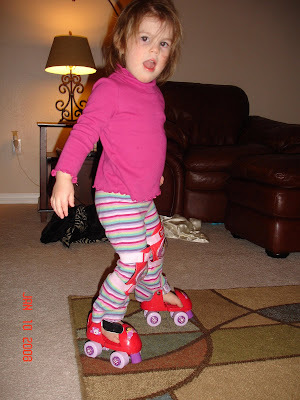 As her present, she wanted Dora roller skates so last night after her bath we tested them out for a minute. Today she wore her shoes with them and did much better. Yes I know my children look a little homely but like I said before I am doing this alone right now so matching clothes are just out of the question!!! Hope the new template is working out for everyone and not giving anyone headaches! I am not a HUGE fan of the new template but we'll give it a try! So, what does the New Year bring me? ANOTHER broken nose! If you're counting, that makes 4 broken noses in my lifetime (2 in the past 2 years). Ain't it great! On the Sunday before Christmas, Sadie whacked me in the face with one of those hard, plastic, Elmo cell phones and I thought I saw stars! I knew it was broken but what can you do for a broken nose-right? So, Ist ignored it and just stayed on Tylenol but it has still been giving me a lot of headaches and I just cannot sleep. Off to the doctor I go and he has put me on some steroids and a nasal rinse thing to get all of the old blood out and to get the swelling down. YIPPEE!! Matt: Why are you wanting to end your service with us? Matt: You are correct ma'am and I will waive that fee. Matt: Yes ma'am have a great day. GRRRRR............I was so dang mad when I got off the phone! Whew....glad I got that off my chest. I didn't mean to start the year off with a venting session and I hope that is not a sign as to how 2008 is going to go for us! 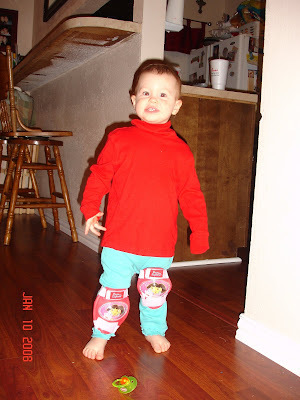 Final Note: We are on day 2 of potty training and I am ready to quit! 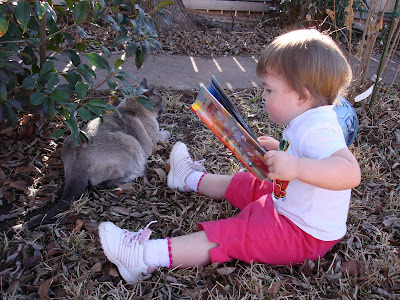 I am so frustrated but Brynn turns 3 in March and I feel that she should be ready for this. I know we are suppose to wait until they are ready but surely she should be somewhat on board for this by now!!!!!! !